I have to admit that while science fiction was a genre that I greatly enjoyed as a teenager, it is a genre that I read only on rare occasions these days. Conspiracy theories on the other hand is a world I can not resist. There is something hugely moreish about them, the wilder the better. I have no idea how many whacked out books on the JFK story I have read! Author Kuykendall joins together Sci-Fi and New World Order ideas in Conspirator’s Odyssey. From UFO’s to Roswell and area 51, the Kennedy assassinations, Watergate, Ronald Reagan’s slide into dementia, Vietnam, even the Bay of Pigs fiasco gets a mention in this novel. These seemingly unrelated events were all connected to one common theme, a shadow government, all along manipulating events to their own ends. This multi decade black government operation is known as the Aneman Project. Simply put, the quest is produce a super army, men, who through genetic manipulation are invincible. The key to this magic elixir comes from the use of alien DNA recovered from the Roswell UFO incident in 1947. At under 230 pages this is a lot of ground to cover, and maybe too much ground to adequately flesh out the characters and the real plot. I think that had I read this book at the galley stage I would have suggested that the author narrow his scope and spend more time on the plot development. Print On Demand is both a blessing and a curse in the publishing world. It was born out of frustration, authors were frustrated by uninterested agents and uninterested publishers. If you were not already a NYT bestselling author no one would even talk to you, never mind publish your book. POD fixed that, anyone can get a book published today, just submit your manuscript, whip out the VISA card and away you go. Unfortunately this has also created a pathway that while removes the road blocks, also removes many of the useful checks and balances. A good editor is worth their weight in gold. Editors do much more that check spelling and grammar, they look at the shape of the story and its flow. Kuykendall has a great story line, and one that in my opinion is very workable. It does however need some tweaks, for example, for the first 40 pages or so, I had no clue what was going on, who the people were, or what their goal was. All became clear a little later, but for a book to be successful you have to have the reader hooked in the first 20 pages or they will move on to other, greener pastures..
Conspirator’s Odyssey is a good first attempt, and I suspect that Kuykendall has probably found it to be a very worthwhile learning experience. I look forward to seeing what his next book is like. You can pick up your own copy from Amazon. 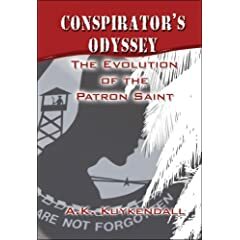 3 users commented in " Book Review: Conspirator’s Odyssey – The Evolution Of The Patron Saint by A. K. Kuykendall "
I read the book as well and found it to be one hell of a read! Your assessment is correct on many levels, but I and many readers don’t look at art the same way as you do and simply consume the story for its entertainment value not from a POD vs. Mainstream outlook. The author reveals so much in this manuscript adding a fantastic twist on historical subject matter and I too anticipate his next work of art as this painting was dilivered with a wide brush stroke that got me all shook up. A promissing picasso … I recommend this read. Conney, you go girl! I read Kuykendall’s debut novel as well and found it to be on hell of a odyssey that got me reflecting back to those history classes from middle school when I was a teen. His take on historical events really was facinating and his choice to kick off this series with a woman at the helm was simply the icing on the cake for me. Simon mentioned Kuykendall’s hook … hell, I was hooked from the ACKNOWLEDGEMENTS and from his impassioned tribute to JFK. When I got to the PROLOGUE, I was still interested. He has a way of expressing his passions through the story to give his readers plenty to contemplate. I for one loved my journey through this new author’s mind and can’t wait until his next installment. I recommend this book aswell! Kuykenall’s a true storyteller and it’s as clear as day that his voice is strong. I was disheartened when I saw the final published book…but check out his sales!